PYEONGCHANG, South Korea -- Snowboarding at the Olympics turned 20 this year, and there's a good chance that in another two decades, people will still be talking about the contest that went down in the mountains of South Korea on Wednesday. It included back-to-back jumps, each with 1440 degrees of spin, that are, quite literally, death-defying. They were tricks White said afterward that he had never landed in succession - not in practice and, of course, never in a contest. "I knew I had it in me," he said. "The fear was out of the door. I'm at the Olympics. I had to do it. I'm standing at the top, in my favorite position, with the pressure of the world and one run to go. Man, it brings out the best in me. I'm so glad that's a part of me as a competitor." He performed what's known as the Sky Hook - a 20-foot vault above the deck in which he bent himself into the shape of a comma, while grabbing the board and tweaking it up toward his backside to show judges the style they demand. His final trick was one he patented: the Double McTwist 1260, in which he took off from the wall for two flips with 1 twists, grabbing the board and practically wrestling it over his head to complete the jump and stick the landing. He knew he'd done it, but the wait - about 120 seconds - was agonizing. "I was trying not to make eye-contact with the judges," White said. Australian Scotty James, who made news at the start of the games by complaining about judging, finished third with a run that included three double-cork 1260s; it was a performance that would've won all but a handful of all the contests ever held up through last December. Shortly after his winning score came up to make him the winner of America's 100th Winter Games gold medal, White was hugging friends and family and sobbing, almost uncontrollably. It was the sort of emotion rarely seen from the man who burst onto the scene as the ebullient redhead shredder dude, then grew into a multi-platform megastar whose light cascades well beyond any halfpipe. #TeamUSA has made it to 💯 Winter Olympic gold medals! 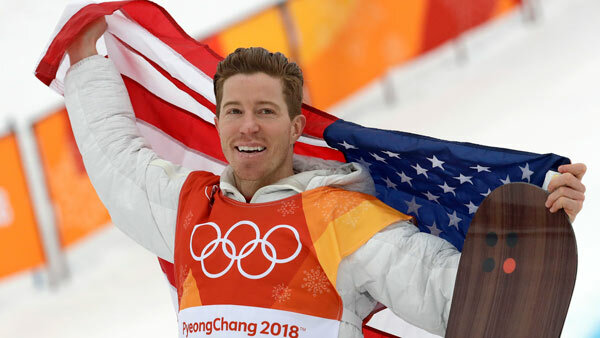 Congratulations to @shaunwhite on making history! White would be the first to admit that a lot of that fame came because of the Olympics. So the win wasn't so hard to put into perspective. "It means everything to me," he said. It means everything because of the journey that essentially began Feb. 12, 2014 - the day after an overwrought, frenzied trip to the Sochi Games ended in a fourth-place finish that left many people, including White himself, wondering if he wanted to do this anymore. He decided 'Yes,' and changed up everything - coach, sponsors, PR. He put his guitar-playing career on hold at around the time one of the band members sued him for sexual harassment (The suit has since been settled, and when asked about it Wednesday night, he called it "gossip" and said "I'm proud of who I am.") and tried to rediscover a love for his sport that had gone lacking. "He ripped his face in half, more or less, and you can still see the scars," said White's coach, JJ Thomas. "And I don't know if anyone else in this world has the mental strength to overcome that fear and lay it down on the world stage." Even with the tantalizing prospect of him heading to the Summer side for skateboarding's debut in 2020 , then possibly returning to Winter in 2022, he'll never match the nine gold medals Usain Bolt collected, the 28 overall amassed by Michael Phelps or the 13 that cross-country skier Ole Einar Bjoerndalen of Norway has won. "As an athlete, to see a human being accomplish everything that's expected of him, it's insane," said Jake Burton, the snowboard maker and one of the sport's founding fathers. Nobody has been harder on himself over the years than White. But after headlining a day on the halfpipe that won't soon be forgotten, he was in no mood to argue. "I'm really proud of myself, which is something I never say," he said. "This meant the world to me."